At this level extensive writing is required, and great attention is paid to full application of writing basics, grammar, punctuation, spelling, etc. Students are expected to write a minimum of 2,000 words per month, with good structure and very few errors. Students will also do a course on communication skills, which is designed to aid in clear and commanding oral expression. At this level students are introduced to successful writing techniques on which to base the development of an excellent, vigorous, highly communicative personal writing style. A section of the course deals with formal techniques for documented research in which students learn the skills needed to develop a thesis, search online and use more advanced library references. Upwards of 20,000 words of formal writing is completed as part of the Literature Program. 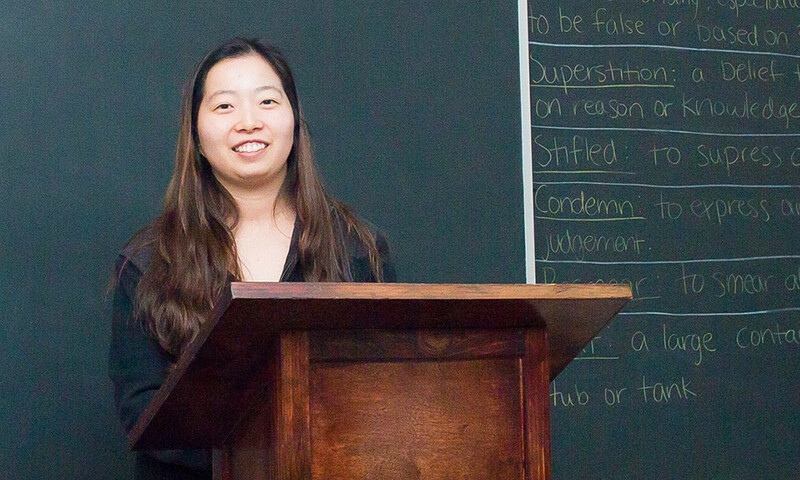 Seniors take a course on public speaking, covering the basics of both developing and delivering a public address and requiring students to deliver several lengthy formal presentations. In another course covering communication skills, students learn how to improve situations and personal relations through good communication. Writing standards in every subject are taken to a higher level. Students interested in developing their creative writing capabilities may take various elective courses in this area.